Perhaps especially for the Men often get the comment " You're too skinny deh , try heavier, seems more healthy , prosperous and fertile . " Even quite a lot of people have the view that obesity can increase one's prestige . Now the question is whether it is a friend that obesity can increase the prestige or as our enemies ? If you are obese , you definitely feel the disruption in daily activities or less agile , impaired breathing and shortness of breath even though doing light activity , and more sweat . Metabolic changes : an increase in fat causes fat cells swell and produce a number of chemicals that can increase the risk of getting the disease . Increased weight : body structure causing interference resulting in damage cells and disease . Harmful fat cells : fat distributed in the abdomen and upper portion of the body lead to higher health risks than fat spread around thigh and pelvis . Obesity has nearly three times the risk for heart disease compared to normal weight . Increased fat in the abdominal area affects the stiffness of the major arteries that deliver blood to the organs of the body . Hypertension can be caused by genetic factors , demographics and biology . However , based on various study , reported that weight loss is beneficial for reducing blood pressure . High blood pressure due to narrowing of the arteries due to fatty deposits . 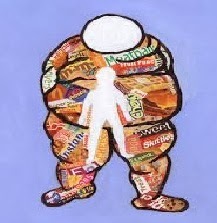 Obesity causes high workload on the heart must pump blood all body tissues . Heart failure occurs does not mean the heart has stopped working , but the power heart pumps becomes weaker than normal . Symptoms of heart failure are: Pulmonary Congestion , patients have shortness of breath during exercise or difficulty breathing at rest or lying in bed , it can also cause a dry cough and shortness of hardware or sound breath ; Fluid Retention , where there is swelling of the ankles , legs and abdomen ; dizziness , fatigue and weakness caused by lack of blood to the brain . Excess fat in the blood make the blood pressure rise , and very dangerous if the blood vessels that supply blood to the heart muscle or even to the brain was not functioning that can lead to stroke and death of heart muscle . Patients with type 2 diabetes can not be denied was a lot of suffering in patients . The disease has an abnormality such as an inability to use insulin in glucose metabolism resulting in an inability to absorb the sugar obtained in the sugar foods should be changed into energy . Obesity can increase the risk of cancer in conjunction with high hormone levels , so it can stimulate excessive cell growth . Some experts believe that weight control may reduce cancer risk by 30-40 % . Obesity is a risk of osteoarthritis in the knee joint , especially for the load bearing too heavy so that fluid in the knee joint can be quickly reduced that causes the bone ends rub against each other causing pain . For advanced stage , could happen attachment between the ends of the bones , so that the foot is no longer able to sustain the body and the patient should sit in wheelchair .